Elaine likes to whip up foil packet feasts in the summer. Here are just a few ideas to get you started. This method makes cooking large amounts really easy – and no pots to clean. Cook these packets in the oven, on the grill, or on campfire cinders. Either way you’ll find that it seems to heighten the flavor as all the ingredients steam together. Make a foil packet: take a sheet of heavy-duty aluminum foil, generously sized, but appropriate to the amount you plan to cook. Drizzle with olive oil; add prepared veg; fold together opposite sides of the foil, rolling down a few times, but leave a little space for the steam to circulate. Then, fold up each end to seal. Cook in a pre-heated oven at about 375oF or grill at medium heat until contents are fork tender. 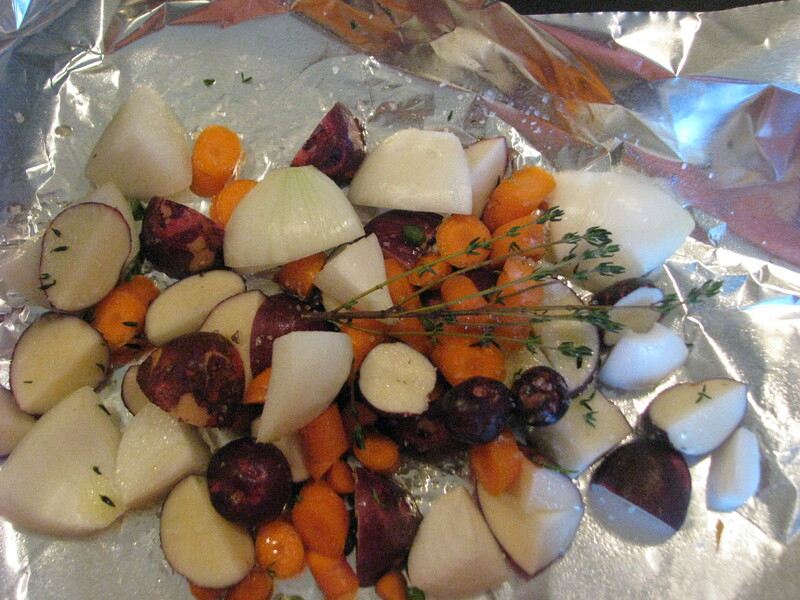 Root Packet: Cut into even pieces your choice of potatoes, onions, beets, and carrots. Drizzle with olive oil; add sprigs of thyme, parsley or your favorite herb, salt, and pepper. Cook approximately 15 minutes. 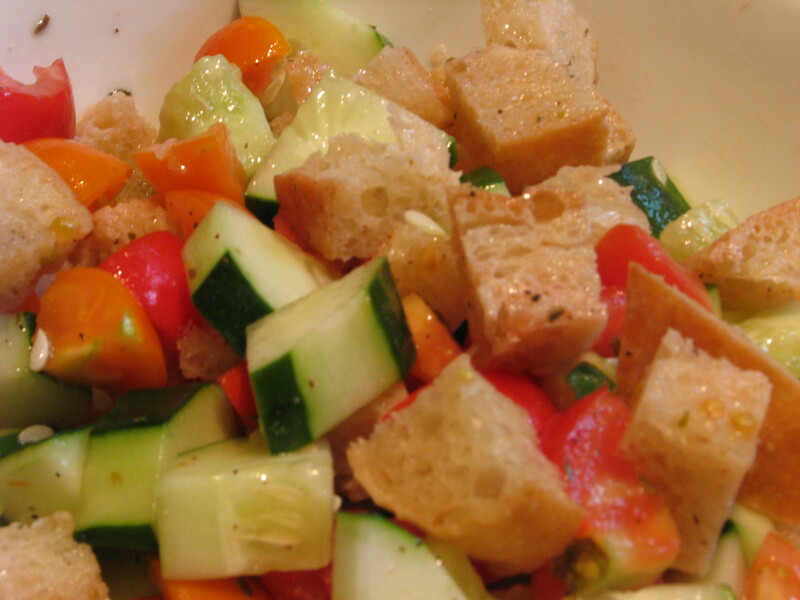 Rustic Ratatouille: Evenly chop summer squash, tomatoes, garlic, and peppers. Drizzle with olive oil; add choice of herbs like oregano, thyme, parsley. Cook approximately 15 minutes. Serve over pasta or rice. Chard: Rinse and chop or rip the leaves and stems of a large bunch of Swiss chard. Add to packet with some olive oil. Add juice of half lemon and then toss in the lemon too. You can also add a slice of tomato to help the steaming process. Cook for about 5 minutes. Roasted Garlic: There is no easier way to enjoy the sweet nutty goodness of roasted garlic for making garlic mashed potatoes, garlic bread, or bruschetta. Use cloves or bulbs of garlic (peeling optional), drizzle in olive oil, and wrap in foil. Bake in the oven for about 30 minutes until tender. The soft sweet garlic will squeeze right out of the peel. Roasted Onion: Leave the peel on an onion to prevent it from burning. Cross-cut ¾ of the way down the top of an onion and stuff it with rosemary, thyme, and a hunk of butter. Add salt and pepper; wrap in foil. Cook for about 10 minutes or until softened through. Happy Friday! 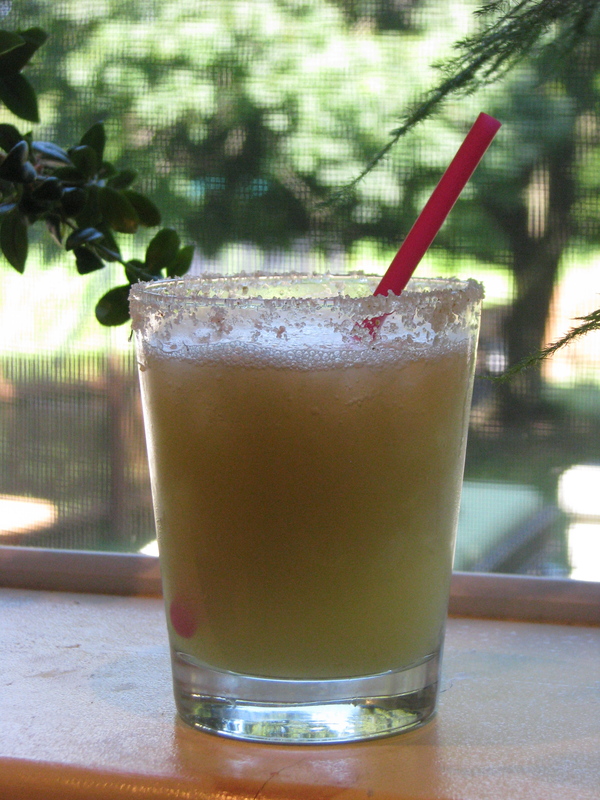 This is sure to freshen up your weekend. Serves 4. Prepare your cucumber by peeling first, then slice in half lengthwise and use a spoon to gently pull and scrape out the seeds. 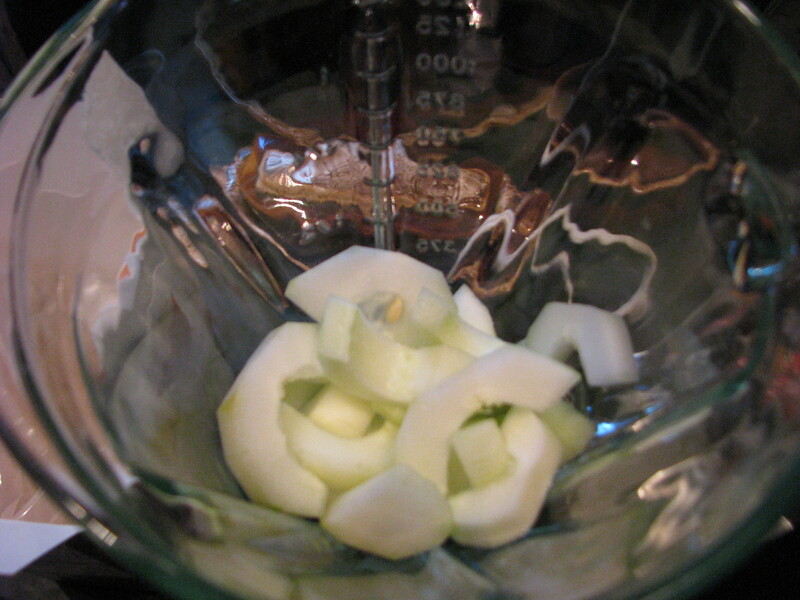 Then slice it up and add to blender along with everything else. Blend a few seconds until smooth. This is one of two ways I like to eat radicchio, the other is in a pasta recipe that I will share later. It’s bitterness is complemented here by the salty prosciutto and the sweet, tangy balsamic. Take off the outer green leaves off and use mostly the inner red ones. 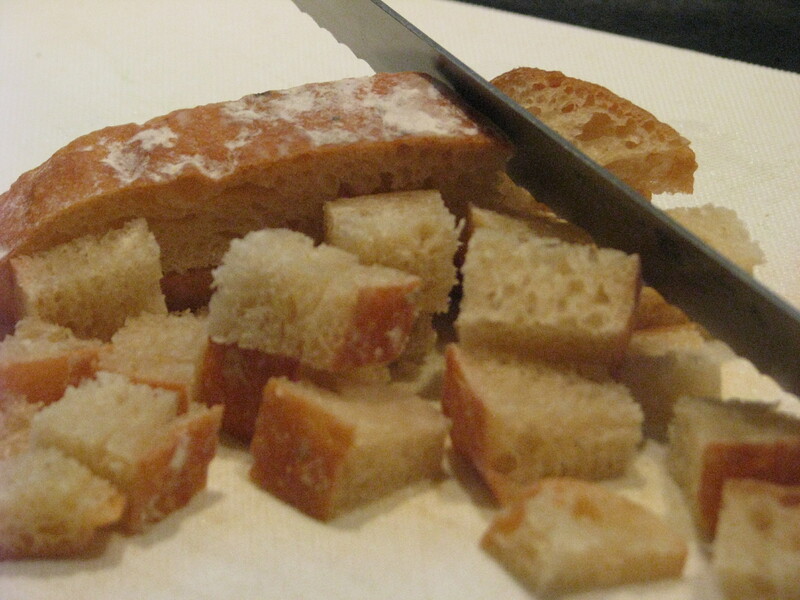 I have used manchego in this recipe, but you could use parmesan or similar. Manchego is a softer milder cheese and it is my favorite! It is Spanish; made of milk from sheep called Manchega. I think prosciutto from the deli tastes better than the pre-packaged kind. Get a 1/4 pound very thinly sliced and you won’t be disappointed. 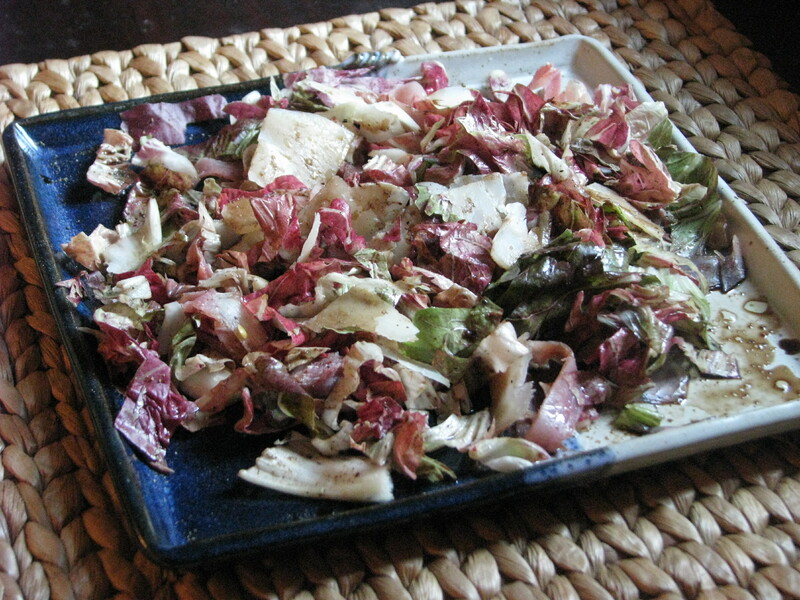 On a serving platter arrange the slices of prosciutto with the shredded radicchio; top with manchego cheese slivers. Drizzle olive oil and vinegar all over salad. The theme this week is Mamas and Babies! These jumbo shells are stuffed with the typical cheeses, but also Swiss chard and baby shells! I often think stuffed shells are heavy on cheese and light on pasta, so I was excited to try this recipe from EveryDay with Rachel Ray. I only modified it to use chard in place of spinach, and some Everblossom tomatoes I still had in the freezer from last season. Many recipes will call for frozen spinach. To help me deal with fitting everything in my fridge, I try to chop, cook, squeeze out the liquid and freeze chard in advance. Then, when I need it for a recipe, I thaw it out and weigh out how much I need. Chard and spinach are interchangeable to me. Once you have chopped and cooked chard at hand, adding it to soups, meatloaf and pasta is easy. 1. Preheat the broiler. In a pot of boiling, salted water, cook the jumbo shells until al dente (about 9 mins). In a smaller saucepan of boiling salted water, cook the baby shells until al dente. Drain separately, reserving 3/4 cup of pasta cooking water. Spread the jumbo shells out on a work surface. 2. In a large ovenproof baking dish, toss the tomatoes with 3 tablespoons olive oil. Broil for 15 minutes. Remove, then stir in garlic, herbs and 1/2 cup reserved pasta water; season with salt and pepper. Lower the oven to 350 degrees. 3. In a bowl, toss the baby shells with the remaining 1 tablespoon olive oil. Stir in the spinach, ricotta, 1/4 cup parmesan, remaining 1/4 cup pasta water; season. 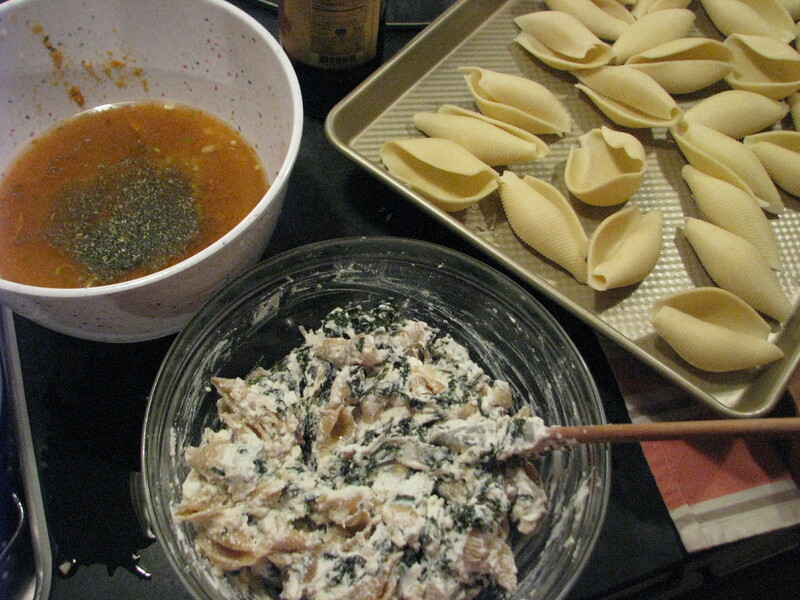 Stuff the jumbo shells with the spinach mixture; arrange in the dish atop the sauce. 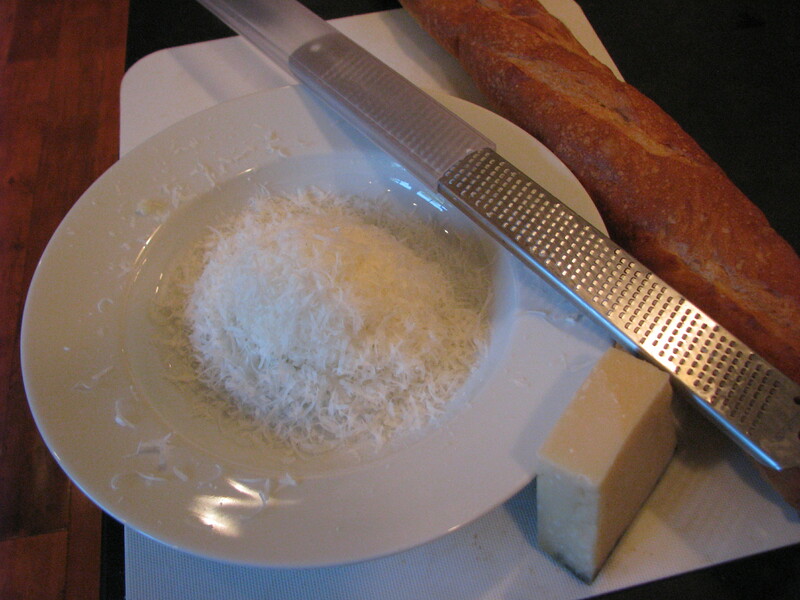 Top with the remaining parmesan, cover and bake until heated through, about 30 minutes. * herbs de provence = equal parts dried thyme, tarragon, rosemary and oregano. The simplicity of this buttery sauce enhances the sweet fresh favas and peas. The basil kicks it all up a notch. Favas take some work, you first have to shuck them from their spongey pods and then blanche them to remove their soft shells. Luckily, I did this with family and had help with all the pea and bean shucking. 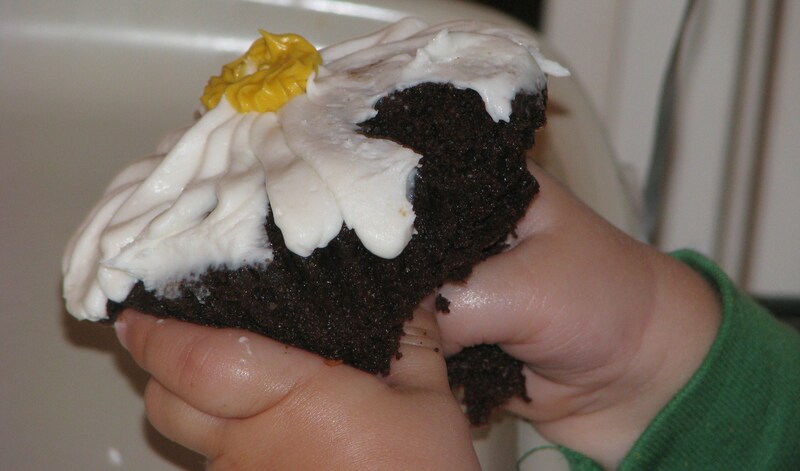 Then it only takes a minute to combine all the ingredients and the result is so rewarding. Thanks to Everblossom farm manager, Vallie, and our farmer’s market customer for suggesting this dish. If there is something you want to see, please let me know. 1. Bring a medium saucepot of salted water to a boil. 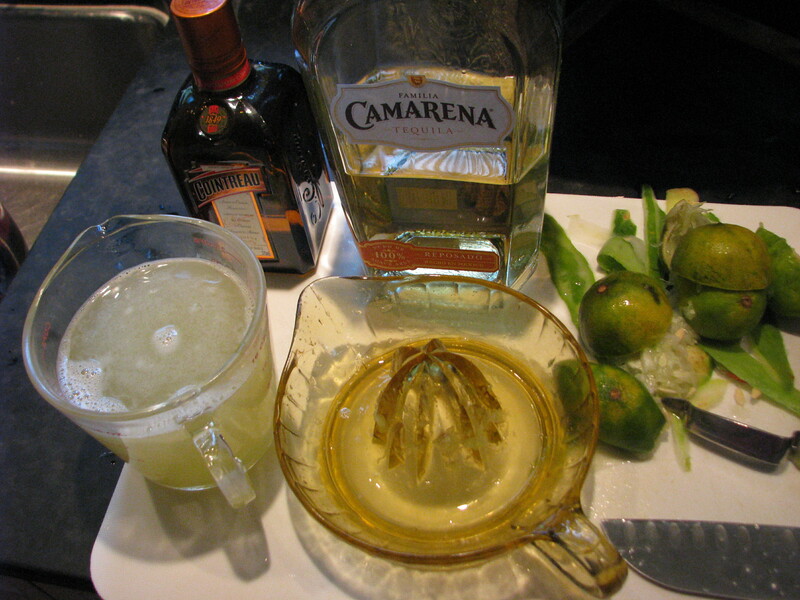 Fill a medium bowl with water and ice. Blanch peas (both kinds) for 30 seconds and use a slotted spoon to transfer peas to strainer in ice bath. Let sit for 5 minutes and pull up strainer to drain peas. Repeat process with fava beans, cooking for 1 minute. 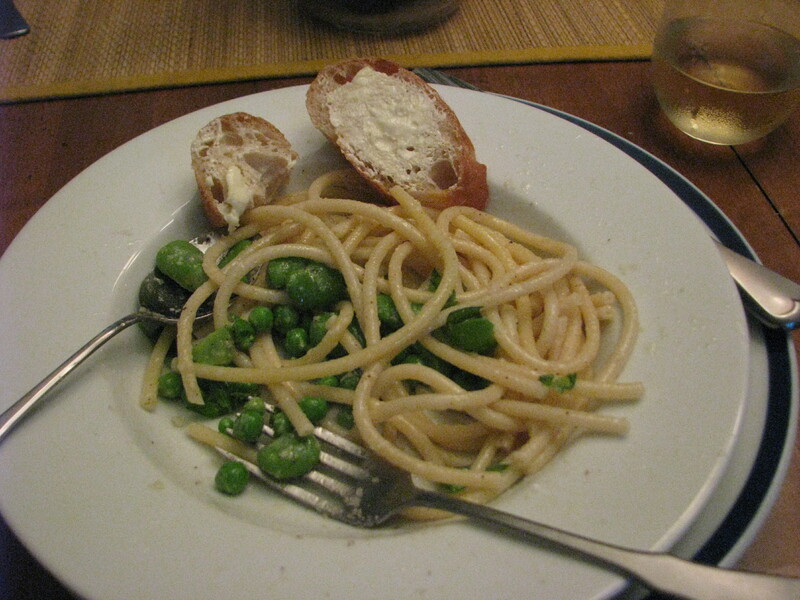 (You can use same pot of boiling water that you used for peas.) 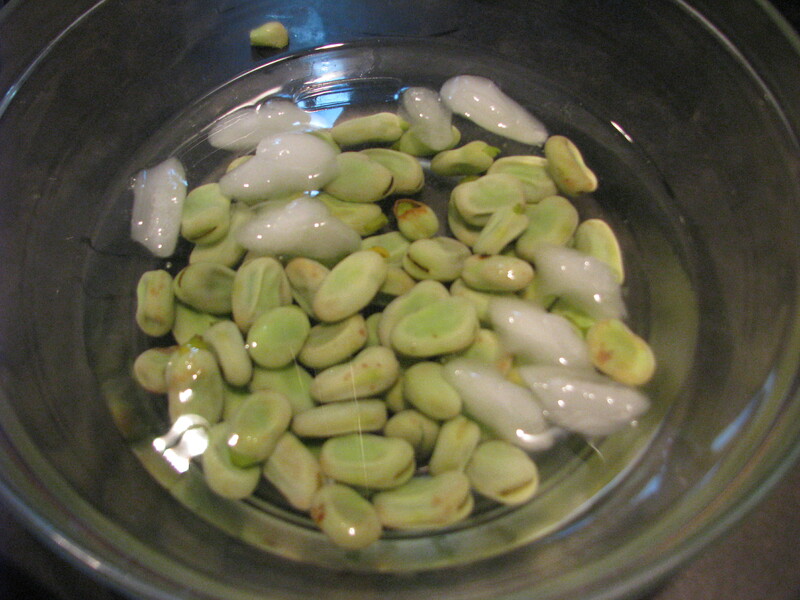 When fava beans have been blanched and cooled, slip off peels. 2. Bring a large pot of salted water to a boil. Add pasta and cook until al dente. Drain, reserving 1 cup cooking water. 3. In a large skillet, melt butter. Add pepper and sauté for 1 minute, or until fragrant. Add 1/2 cup of the cooking water. Stir until sauce begins to thicken, about 30 seconds. 4. Add cooked pasta, pecorino and Parmesan and toss until cheese melts, about 30 seconds. Add peas and fava beans. Toss very well to coat, adding more pasta water if pan seems dry. Season with salt to taste. To serve, sprinkle each portion with more pecorino and drizzle with olive oil. Mix in and garnish with basil.